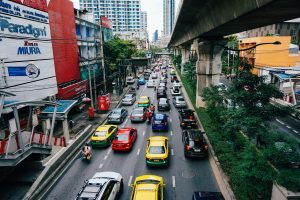 Foreigners who reside in Thailand and want to drive a car or motorcycle in Thailand should apply for a Thai driving license. The Thai driving license is essential since the international driving permit is not valid for driving in the country of residence. The purpose of an international driving permit is to translate the domestic driving license, certify the validity of the driving license in the country of residence, indicate the categories of motor vehicles that are covered by the driving license and improve the road safety worldwide. Though Thailand has not signed the Vienna Convention on Road Traffic (1968), tourists are allowed to drive a car or motorcycle with an international driving permit in Thailand. This is due to the fact, that Thailand is still a member state of the Geneva Convention of Road Traffic (1949). However, the international driving permit is not a substitute for a valid domestic driving license and can only be used in a foreign country, other than the country of residence. The Applicant has to submit the required documents at the Department of Land Transport personally, undergo a physical test and a one-hour driving seminar. It is recommended to apply for the car and motorcycle license at once. The applicant will need to submit two sets of the required documents.